Amazon purchased Whole Foods for $13.7 billion in 2017. Since the purchase, changes at Whole Foods have reshaped the shopping experience once enjoyed by many at this largely organic, high-quality grocery store chain. Price cuts in the range of 50% on commonly purchased items like avocados, eggs, fish and fruit echo loudly as the competition with Walmart and Trader Joe’s heats up. This massive purchase was thought to be transformative to the way we purchase and consume in the U.S. as evidenced with a push for Amazon to deliver more and find more avenues to drop off a package on your doorstep more often. Enter Prime Now. I thought it was time to test out the Amazon innovation called Prime Now – a two-hour grocery delivery service that is FREE for Amazon Prime subscribers. If you’re like me and the other 100,000,000+ Amazon Prime subscribers described in Jeff Bezos’ most recent 2018 letter to shareholders, you may wonder just what your annual Amazon Prime fee affords you. Maybe you subscribe for the free two-day shipping. Maybe you use Prime for their online video and music content. Perhaps, it’s access to the Kindle Library or the tons of other innovative benefits designed to keep you plugged in to and buying from the most successful online retailer in U.S. history. So, it’s time to find out just how good the service is and, of course, because you know me, let’s dig in to see if it’s really a financial bargain after all! For additional due diligence, I went the extra mile for you. I also went onto the Safeway and Costco apps, which allow you to deliver groceries to your home. These home delivery services require you to have an account prior to ordering. Worth noting – Safeway’s account is at no charge whereas the other two providers come at an annual fee. The first thing I noticed when browsing for groceries – you better not be too tied to a certain brand with Prime and Costco. You will not find everything you are accustomed to buying in the aisles of your local grocery store. The Safeway app is as close to the actual store as possible. So, if you are flexible on your brand names, Prime and Costco will work fine; otherwise, Safeway is the best option for endless product variety. If you are a regular consumer of high quality organic meats, Prime Now offers exactly three choices: two ground beef and one chicken breast. Costco offers an easy option for finding organic foods – the organic tab lets you shop their available products quickly and easily. You need to dig around the Safeway app to find all the organic offerings by using the search feature, which can be time consuming. The easiest way to navigate this app is by using the “aisles” function, which once you get used to it, is a lot like browsing the store. Again, for choice – Safeway has the most selection in Organic by far. To gain an understanding of prices, I broke this down into three categories: meat, eggs and bread. Meat. Organic chicken at Amazon was $9.99/pound, Safeway offers a few organic chicken breast choices at $6.99/pound and at $6.19/pound, Costco forces you to order five pounds per package, so you better be hungry to get the best price on chicken. Either Safeway or Costco offer fine meat choices and I found Amazon very limited. Eggs. Eggs told an interesting story about price. Prime Now offered a few choices between $4-$5 per dozen. Safeway was priced better with more choices for eggs in the $1.77 to $4 range per dozen. I was expecting Costco to be the price leader here, but they weren’t with prices between $2.20 to $4. Safeway and Amazon lead the way in the egg department and if you don’t care about buying organic/cage fee eggs, Safeway is the best choice. Bread. Safeway, Costco and Amazon finally carried the same item, so that became an obvious point of comparison with one particular product so we can clearly see a price difference. All the companies sell Famous Dave’s White Done Right 24-ounce package of bread. Safeway’s price was $5.49, which is 30 cents less than Prime Now (5.5% cheaper). Costco carries two 24-ounce bags that cost $9.79, or $4.85 per bag (11.6% cheaper than Safeway). So here again, if you like what Costco has, and you can handle the quantity, they deliver the best price. Other product comparisons. Amazon, Safeway and Costco go neck and neck with offering better prices on a variety of items. When it comes to things like ordering batteries, laundry detergent or items in bulk, Safeway would be the least attractive option. Yet, for any regular shoppers at Safeway, you should already know you aren’t getting the best prices on those types of non-perishable items at the store. I noticed differences in price that would sometimes favor one site more than another without reason – like Prime may offer better cucumber prices, or better prices on Raisin Bran, but it wasn’t clearly superior to Safeway’s prices consistently. Here the rule is if you can buy in bulk, certain items have a clear advantage for Costco where plenty of items are priced very well on both Prime Now and Safeway. So, the conclusion is – buying in bulk, of course, is best, especially with non-perishable, which puts us back to Costco as the winner here, Amazon in second and Safeway last. Now we start to see some differentiation – Costco occasionally ran into trouble delivering on the same day and remains by far the least competitive delivery service of these three options. Shoppers on the Costco app also need to know this – YOU CAN BUY THE SAME ITEMS AT COSTCO CHEPAER THAN ONLINE! Yes, the same perishable items are cheaper at your local Costco as they mark up the price for home delivery. In fact, some of the Costco items are marked up 20% more than they are in stores, so be careful before buying on their app. In some cases, the prices are the same, but in many cases, they are not, especially dealing with products that require refrigeration. Prime Now and Safeway both touted same day delivery and Prime Now boasted even faster door-to-door service when comparing the two sites. Prime Now states that it is free, but tips are suggested to the drivers and even automatically added onto your bill. So, keep in mind that unless you make your tip $0, you will be paying for delivery on Prime Now. So, it’s technically free, but I don’t know the last time a tip was suggested and you decided not to tip at all! Be sure to count on some kind of delivery fee in the form of a driver tip. Safeway doesn’t not have a free delivery option at any level, but for orders over $150, they charge $9.95, and $12.95 delivery for every order under $150. If you shop every week, this price could add up quickly. Costco charges nothing for total orders over $75, but for orders under that threshold, each item comes with a markup as described above. The challenge here is if you are as frequent a grocery buyer as I am. It is not uncommon for a weekly grocery trip. Let’s say each trip I spend $150/week; over a one-year period, I am paying $520 in delivery charges, and that also assumes I never tip any driver. So, the convenience of having the entire store delivered to your front door does not come cheaply. In conclusion, unless you have no free time at all, and absolutely cannot make it to the grocery store, it doesn’t seem financially superior to use any of these services. Amazon can be good for a few items, especially those deeply discounted, so it is beneficial to check in with them periodically. 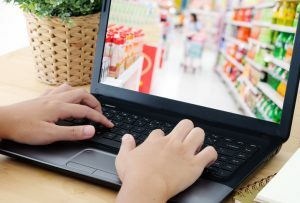 Yet none of these sites save you money compared to the current system of going to the store, finding deals, buying in bulk when you can and searching the web for great values. Sadly, the best way to get your groceries for now is the way you have been doing it! Yes, the technology does work. Yes, the prices can be good, but the bottom line for this financial piece – take the time to find great values and terrific foods the old-fashioned way.